For the largest groups, the 56-passenger MCI coach is a godsend. 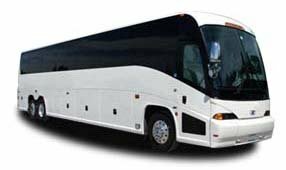 The largest motorcoach model on the market, this charter bus is capable of comfortably supporting sizable groups of students, corporate employees, sports teams, wedding attendees, and more. No matter the distance, this model can be tailored to your precise needs, with a number of customizable amenities, cutting-edge features, and savvy, reliable drivers. NYC Charter Bus Company provides around the clock service for anyone in need of a high-quality coach bus. We have a team of dedicated reservation specialists who work nonstop to ensure you get exactly what you need to have a successful trip. Call us at 212-756-1283 for a free quote and more information about how we can assist you!